Complaint: Misdemeanor misspelling of “Philly” – an accepted nickname for Philadelphia, known as the city of brotherly love and corrupt mayoral figures; misdemeanor spelling of “Rotisserie” – a word believed to be of French origin used to describe things cooked on sticks in convenience stores; making offense permanent by mounting on signage; hanging signage from an extended awning so as to expose innocent passers-by to grammatical indecency; affixing Christmas lights to extended awning so as to draw further attention to grammatical indecency; failure to remove Christmas lights more than 30 days after Christmas. 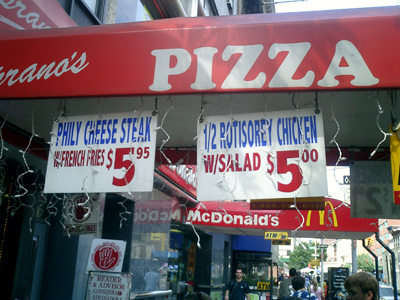 Defendant: Soprano’s Pizza, 6th Avenue. Report: Officer was off-duty and trying to remember the lyrics to Chicago’s “You’re My Inspiration” when infraction was discovered. Officer approached carefully as venue in question shares the same name as a fictional organized crime family.